Sewing Machine Repair Book Now At Amazon!! Now that we are all involved with fall sewing projects, this is NOT the time to have problems with your sewing machine! We are THRILLED that our “Sewing Machine Repair for the Home Sewer is now available at Amazon!! This has been our most popular book of all time, and has helped literally thousands and thousands of people repair their OWN sewing machine instead of having to drag it to a repair shop and leave it for a week or two. Check it out! 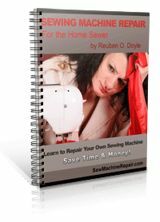 Of course, our Sewing Machine Repair as a Home Business, the Serger Repair for the Home Sewer and the Complete Guide to Treadle Sewing Machines are available at SewMachineRepair.com. You can check out all of our books, and be able to keep your machines in tip top shape and ready for use!! Every book is written in step by step instructional style with diagrams and illustrations to go along with every step. 40% Off Our Most Popular Repair Books! 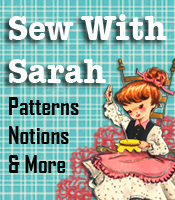 Do You Sew Mostly For Plus Size Women or Plus Size Children? There are many articles regarding the statistics concerning overweight/obese children, as well as the numbers of full figure/plus size women (adults actually – not just women). We’re wondering if you who are in a sewing / alteration business actually do MORE sewing for the overweight children category or plus size women. While I would venture to say that regardless of which category you go with, there are enough potential clients to keep you busy. As you spread the word about your business, you will see a steady increase in customers. Flyers in a fabric store, small classified ad in your local newspaper or mini flyers in every “local” bill you pay (local gas bill, water bill, power bill, etc), will certainly increase your customers as well. In the near future we will be doing some tutorial type posts for working with these two categories of customers, and we just want to get a feel of who you all are sewing for, so we can concentrate on what the majority of our readers need. We have three websites you can look at to see the types of information we have available already to help make it easier to sew for those truly hard to fit individuals. These sites are BigBeautifulPeople.com, (for big/tall men and full figure/plus size women), PatternsThatFitYou.com, (for men, women and children) and PlusSizeChildren.com (for overweight/obese children). You can see our tutorial post about making a custom skirt for plus size girls using their own personal measurements: http://sewingbusiness.com/2012/07/26/how-to-make-a-custom-fitted-skirt-for-an-overweightobese-child.aspx — and we’re planning to add more of the tutorial type posts to help answer your questions about sewing for overweight and plus size people. No Plus Size Patterns For Children Under Age 6??? Wait A Minute!!! Because this is NOT the first time this has happened to me, I want to tell you about my fabric shopping trip today, so you can keep your eyes open the next time you are out shopping for fabric. I went into Joann’s today to get some denim fabric — sounds simple enough. They had all their denim fabric on a round table type rack with a price sign above the bolts “denim $12.99 yd”. Some bolts were 45″ wide and some 52″ wide, so I started picking up the fabric so I could read the bolt end to see if they were 100% cotton, or what the fabric make-up was. WELL, I noticed SOME bolts had the regular printed $12.99 per yard on it, some had the “original” price blacked out and $12.99 hand written on the end of the bolt, some had the original price blacked out and a printed new tag (from a tagging gun) with $12.99 on them, and ONE of the bolts still had the original $9.99 price on it. I made up my mind very quickly that the $9.99 denim was exactly what I wanted —- AND I had a 50% off coupon. When I went to the measuring counter I told the lady that I wanted to confirm the price to be $9.99/yard. She scanned it with her little hand held device then informed me that the price of the fabric was $12.99, but was on sale 30% off (NO sale price was anywhere by the fabric bolts), so I’d be getting it for $9.09 per yard. I told her that the price on the end of the bolt said $9.99 per yard, and asked if she could do a price over-ride to give me the price that was on the bolt. I figured if she could do that I could maybe use my 50% off coupon. Well, she did the price over-ride at $9.99/yard, but the charge slip showed that it was a SALE PRICE, so I wouldn’t be able to use my coupon AND I’d be paying more than the 30% off the newly raised prices. So I asked her if she could do the price over-ride and take into consideration the 30% off as well to let me take advantage of the sale. She really didn’t want to but finally said, “let me see if the hand held device will let me”, so she did figure the 30% off the $9.99 price and used that as the over-ride price and it went through just fine. The facts are that all prices keep going up and up, however IF a company changes the prices, but leaves the end of the bolt with the old price, they are obligated to sell it to you for THAT amount, not the higher amount. If you are not observent and notice the little things, you could end up paying the higher price, even though the price on the end of the bolt is the old price, simply because the NEW price is in the computer and that’s what you’ll be charged if you don’t question it. We buy a lot of fabric and there have been times that we’ve gone in one week to buy certain fabric, and the next week the price has been raised by $2 or $3 per yard —- in one weeks’ time! Or some specialty fabric that all of a sudden jumps up by several dollars a yard. I would suggest to you to check the prices very carefully on the fabric that you need — and if at all possible save up some discount coupons that you can use. Most of all, be sure you read the prices on the end of the bolts and CONFIRM with the measuring person that the price you see is the price you will be paying! You could just be saving yourself a couple dollars per yard by getting the price verified and confirmed. What Do You Do With Your Empty Thread Spools? This post is to pass along some information about how and why I stock up on fabrics this time of year. Each of us that are in a sewing related business have a tendency to use a LOT of certain types of fabric. For example, those who are in the quilting field, whether it’s regular bed quilts, quilted table placemats, quilted wall hangings, etc probably all use a large quantity of quilt batting. Those who do regular sewing probably go through several bolts of interfacing throughout the year, and those making craft items may use certain solid colors. For me and the coupon clutches we sew, we go through bolt after bolt of cotton duck fabric — brown, black and red. You get the picture. Well, this time of year it seems like the online fabric sites are in competition with each other to see who has the best deals for the customers. For example, right now JoAnn’s has the queen size quilt batting packages 50% off, and has a code for free shipping. They also have 50% off their entire stock of home decor fabrics plus good discounts on other types of fabric. Fabric.com has some super deals now on a large variety of fabric types and they ALWAYS have free shipping if your order is over $35 — and the way we buy fabric, that total is very easy to reach. You can also get some really good deals in the fall at ebay, and I believe the reason for that is because people / stores are trying to get their inventory lower this time of year before time to count for tax purposes. Soooo, every year at this time I start looking for those 50% off sales – free shipping – and sometimes there are even extra “codes” that get you an additional 10% off your total sale, regardless of whether you’re buying regular price or sale price items. Think about how this can HELP your bottom line!!! Boy howdy – when I can get that cotton duck 50% off with free shipping, you can be assured I’m going to be buying a minimum of 2-3 bolts of each color! Think about what it is that YOU use a lot of throughout the year and go ahead and stock up on those particular items NOW while there are super savings available. Whose Products Do You Promote Most? Petite Children Have Special Sewing Needs Too! Who Makes The Most Affiliate Income?